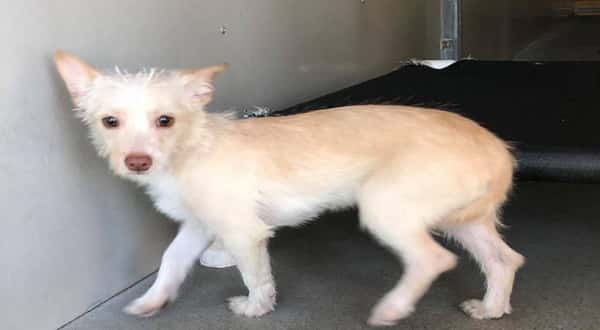 4 months old puppy who at his young age seems to sense that the stakes are high, can often be found tucked away shaking in his favorite bed, cowering in fear from the noise and chaos that is the San Bernardino City Animal Shelter. When the lights go out, and everyone goes to sleep, soft and subtle weeping could be heard coming from her kennel space. He cries himself to sleep every night wondering what on earth he did to deserve his new fate. Sad indeed. I am a male, blonde Terrier mix. Shelter staff think I am about 4 months old. I have been at the shelter since Feb 06, 2018. 1 Response to "4 months old puppy is very terrified. Most of the time, he's hiding under the bed"